26 Then God said, “Let us make mankind in our image, in our likeness, so that they may rule over the fish in the sea and the birds in the sky, over the livestock and all the wild animals, and over all the creatures that move along the ground.” 27 So God created mankind in his own image, in the image of God he created them; male and female he created them. 28 God blessed them and said to them, “Be fruitful and increase in number; fill the earth and subdue it. Rule over the fish in the sea and the birds in the sky and over every living creature that moves on the ground.” 29 Then God said, “I give you every seed-bearing plant on the face of the whole earth and every tree that has fruit with seed in it. They will be yours for food. 30 And to all the beasts of the earth and all the birds in the sky and all the creatures that move along the ground—everything that has the breath of life in it—I give every green plant for food.” And it was so. 31 God saw all that he had made, and it was very good. And there was evening, and there was morning—the sixth day. The creation of man and women is, of course, a good thing. None of us would be even studying together Genesis had we not even been created. This particular Sunday is called “Youth Sunday” in our church. We will hear from our young adults about a mission trip where they spent one week in New Orleans helping those in need. To help us prepare for their message, we can look at a few important facts about mankind’s creation. God created the heavens and the earth, and all life in six days, while He rested on the seventh day. Man is pictured as the crown of God’s creation. In order to maintain a chronological format, only a very general description of man’s creation is given in verses 26-31. Man is the last of God’s creatures. The whole account builds up to man’s creation. An important distinction is made here, man alone is created in the image of God. While there is considerable discussion as to what this means, several things are implied in the text itself. Man is created in the image and likeness of God in his sexuality. 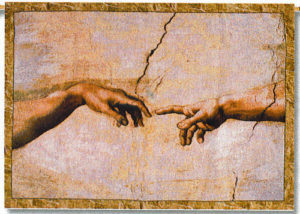 And God created man in His own image, in the image of God He created him; male and female He created them (Genesis 1:27). This is not to say that God is male or female, but that God is both unity and diversity. Man and woman in marriage become one and yet they are distinct. Unity in diversity as reflected in man’s relationship with his wife reflects one facet of God’s person-hood. Further, man reflects God in the fact that man rules over creation. God is the Sovereign Ruler of the universe. He has delegated a small portion of His authority to man in the rule of creation. In this sense, too, man reflects God. Notice as well that it is man and woman who rule. Sorry guys, men don’t have exclusive rights in this area. The word “them” in verse 27 refers to man and his wife, not just the males. While Adam has the function of headship (as evidenced by his priority in creation, in verses 36-38, Adam becomes the source of his wife, and his naming of Eve. Eve’s task was to be a helper to her husband. In this sense both are to rule over God’s creation. Should we fear Good and why or why not? Or another way to look at this: How would you feel if you gave a gift to someone you love and they didn’t care about it at all? Where is it that people can “hear” the Good, God’s good? How is it that we see Good, not just any good but God’s good? If men and women are to reflect God, how is it that the “Mirror” comes to be? 11 Therefore encourage one another and build each other up, just as in fact you are doing. 12 Now we ask you, brothers and sisters, to acknowledge those who work hard among you, who care for you in the Lord and who admonish you. 13 Hold them in the highest regard in love because of their work. Live in peace with each other. 14 And we urge you, brothers and sisters, warn those who are idle and disruptive, encourage the disheartened, help the weak, be patient with everyone. 15 Make sure that nobody pays back wrong for wrong, but always strive to do what is good for each other and for everyone else. 16 Rejoice always, 17 pray continually, 18 give thanks in all circumstances; for this is God’s will for you in Christ Jesus. This letter is from Paul, Silas and Timothy. From these three, the apostle Paul was the main author. We do not know how much of the letter Silas and Timothy wrote, but all three of them were in agreement with what the letter contains. This letter may be the earliest of the letters of Paul that we have. Paul and his friends wrote it between AD 50 and AD 53. That is about 20 years after Jesus’ death. Paul was on his second main journey in which he spread the good news about Jesus. He and his friends were in the city of Corinth when they wrote the letter. We can be sure about this, and about the date, from the letter and the book of the Acts. Verse 11 begins with a promise: All who believe in Jesus will live with Him. Because of this, all can encourage each other as they speak about those things talked about in Scriptures. Believers can help those who have doubts and fears. They can help them by showing them that Jesus accepts them as they are. We are called to help each other to know God better and to love Him more. The Lord had called their leaders to this task and they served Him in it and they were working so hard for the good of the church. The Christians at Thessalonica should be grateful for them and for all that they do. Their leaders deserve all the support that they can give. They should love their leaders, as the leaders care for the church. One of the aims of the leaders’ work is to keep the members in unity with each other. Christians should always try to live in peace with each other. There were some of the Christians in Thessalonica who would not work. It was not that they could not work. If that had been true, then it would be right for the church to support them. No, they were just lazy. The members of that church, not just the leaders, should tell them that they must work. They must warn them that it is not right to expect other Christians to provide for them. Some people there were weak in some way. Weak people need strength and courage. They should not be afraid to tell other people that they are Christians. Christians must hold on to such people and help them to become stronger and more bold. Such people need to know that they are not alone. In all their relations with these people, the Christians should be patient and kind. They should show respect to all people. And they should have patience with all people. No matter how wrong the actions of a person are, we should not, in turn, do wrong things to them. It would be natural for us to want to do it. There was an old rule of ‘an eye for an eye and a tooth for a tooth’ (Exodus 21:24). This meant to do to the other person as he or she has done to you. But this is not how Christians should behave. They should forgive. And they should want to do good things to those who have done wrong to them. Some people do not believe in Jesus. For those people, joy depends on the good things that happen to them. But the writers are talking about a different kind of joy here. This joy does not depend on what happens. If it did, the Christians at Thessalonica would have little cause for joy. Real joy comes from knowing Jesus. The Holy Spirit gives joy to all who believe (1 Thessalonians 1:6). Christians should allow this joy to be in them and to affect the whole of their life. The new life that they have from God is full of joy. They know that God is with them. So, they can have joy although they are suffering. We should pray to God often because they depend on him for all that they need in life and because we love him as our father. God works in all things for the good of those who love him (Romans 8:28). So, we should give thanks to God in every good or bad circumstance. He is in control and He allows both good and bad times to come to us. But in the end, the result is always to bless us. God wants us to be full of joy. He wants us to pray at all times and to give Him thanks. This is how those who are in Christ Jesus ought to live. Paul seems to say pay attention to the good that others do – Why? Paul gives a command to warn others who are idle (lazy and disruptive) – What do you think this means as far as you are concerned? Almost in conflict with warning others is a command to live in love and peace – Is this a reasonable request? How can we accomplish it? How do we encourage one another to work, get along and be peaceful? What ways can we work to build each other up? Are the commands Paul gives in 16-18 impossible commands? What do you think he meant? We are finally called to “BE” good. What is the role of the Christian Church in helping people seek this goal?